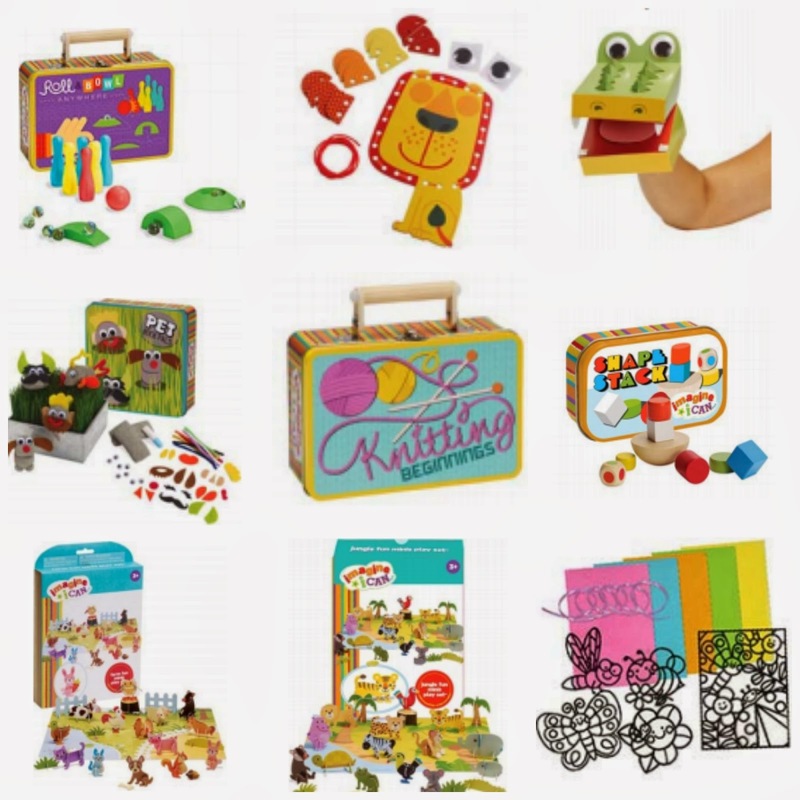 being MVP: Affordable Stocking Stuffer Ideas for Kids: Manhattan Toy + Giveaway! 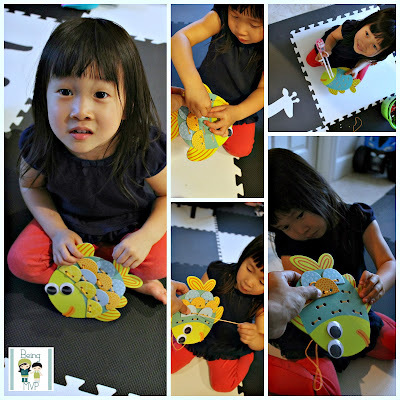 Affordable Stocking Stuffer Ideas for Kids: Manhattan Toy + Giveaway! The Giraffe and Lion Imagine I Can Create-a-Puppets were hits as I had imagined. Kenzie knew how to peel off the double-sided tape backing and apply it to the coordinating spots on the puppet parts. I helped in folding and attaching the sections to secure. The giraffe's string mane had a bit of a hard time staying on because Mason kept on running off with it. No glue or scissors needed which makes cleanup a breeze! Kenzie enjoys the giraffe as much as the alligator and is having loads of fun with it. What's neat about these paper hand puppets is that they are only $6 yet have so much play in them. 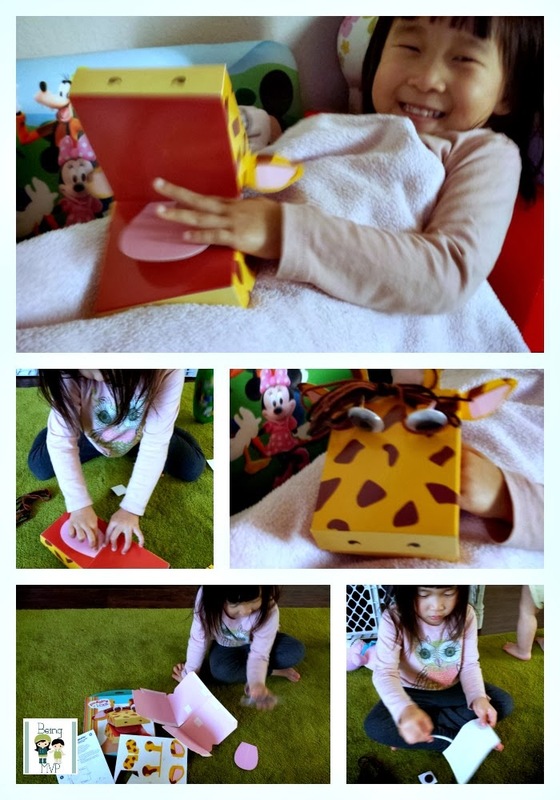 You can create stories and make animal sounds as well as chase your little brother around the house with chomping actions. A great stocking stuffer as well as party favor idea. The Fish and Porcupine Imagine I Can Lace & Play Animals are actually pretty neat and build motor skills for my little Kenzie. Just having her punch out the holes to prepare the fish for play took a bit of time. She used her noggin and grabbed her chopsticks from the kitchen to help in the task. After all the holes were punched out, she added the sticker fish eyes and we were ready to lace. I showed Kenzie how to place each scale on top of the fish and to weave the lace up and over continuously until all the scales were in place. There was a bit of a learning curve but she got it and was excited when the fish was complete. What's neat about these lace & play animals is that you can play with them over and over again and in the interim, just tie off the ends. Another fabulous stocking stuffer idea for just $5! Make sure to connect with Manhattan Toy on Facebook, Twitter, Youtube and Pinterest! One winner will Receive Choice of Imagine i CAN® Product from Above! I would love the peek and squeak monkey to put in my daughter's stocking for her first christmas! I also love the Nursing Nana. I have 4 grandchildren to stuff stockings. I also like the Imagine I Can Secret Agent Spy Gear. I also like Snuggle Pods Sweet Pea for my grand baby. My daughter would love this, also she would like the Groovy Girls Royal Treatment Gift Set. I like the Imagine I Can Finger Paint Fun and I would like to put this in my granddaughter's stocking. I like Miniwinks Hare for my niece. I like the Groovy Girls Princess Seraphina and I would be stuffing dd's stocking! The lana ladybug dressup is beyond cute. I would be stuffing my daughters' stockings. Ilike the Imagine I Can Secret Agent Spy Gear. Thanks so much for the fantastic giveaway! I would love to get the Dr. Seuss Hand Puppet THE CAT IN THE HAT for my granddaughter. My son would love the spy gear! I would love to get it for him for Christmas. And if I won this, I would stuff my daughters stocking! My daughter will be dancing to a song from the Grinch for her Christmas recital, so I'd love to give her some of the cute plush characters! 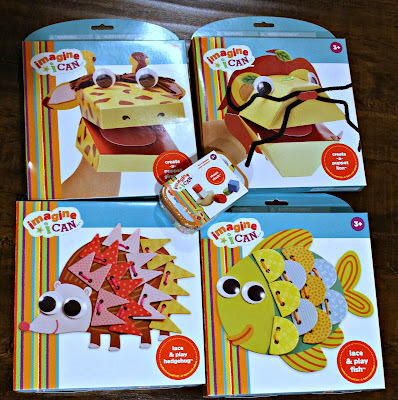 The Miniwinks animals are so cute and would make perfect stocking stuffers for my kids! I also like their Imagine I Can Finger Paint Fun. This would be a stocking stuffer for my little grandson! my son would really enjoy the put and peek birdhouse!! This would really help the little hands with coordination! My daughter would love the Groovy Girls Princess Ariana. I would stuff my daughter's stocking. I'd love the Groovy Girls Craftalicious Cupcake Creations for my daughter's stocking! Create and play pattern blocks; this would be for my son. I like the Snuggle Pods Sweet Pea! It would be great for my niece! I like the stuffed Horton Plush from Horton Hears a Who... My toddler loves elephants, so this would be fun for him. The Crazy Caterpillar Bowling looks like fun. It'd be for my kids. I like the Snuggle Pods Sweet Pea for my daughter. I like the wooden car assortment and the play and learn cash register. I'd love to stuff my daughter's stocking with the Baby Stella Brunette! SUCH a cute idea!! I love that they are cheap but so much fun!! Yay for craft time!